The California drought of 2014 has been extraordinary. 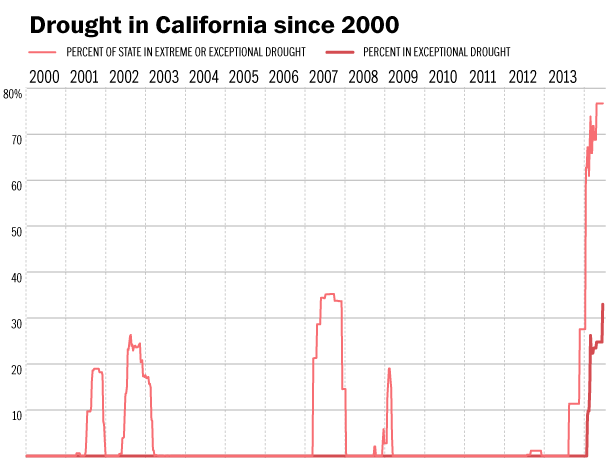 The chart above shows the drought in California since 2000. Surveys show that people in California have become desperate about the water situation. The State is taking tiny steps. Governor Jerry Brown signed a bill, for instance, preventing homeowners' associations from enforcing lawn-watering requirement during a drought emergency. However, Californians don't seem to care, actually increasing their water use by 1% in May 2014 over the previous May. NASA has evidence that the water situation in the West is actually very bad. Water levels are way down, and more and more people move there. The animation below shows the progression of the California drought from the beginning of 2014 through mid-July, 2014. It was created using U.S. Drought Monitor maps. It shows that the drought area is not, as you might think, in the desert regions, but along the coastal strip including and between Los Angeles and San Francisco.